President Donald Trump told reporters Thursday that he is concerned Washington Post columnist Jamal Khashoggi might be dead. "It certainly looks that way to me," Trump said as he departed from Joint Base Andrews. "It's very sad. Certainly looks that way." While U.S. officials are awaiting the results of three investigations, the president said he feels confident "we should be able to get to the bottom fairly soon." He added that he would consider "severe" consequences if oil-rich ally Saudi Arabia was involved. Vice President Mike Pence went a step further during a stop in Denver earlier in the day and vowed: "The world deserves answers." "If what has been alleged has occurred. If an innocent person lost their life at the hands of violence, that's to be condemned," Pence said. "If a journalist, in particular, lost their life at the hands of violence, that's an affront to a free and independent press around the world. And there will be consequences. But we'll wait for the facts, we'll wait for all the information to come in." The comments from the president and vice president were some of the strongest from the pair to date in the wake of mounting questions over the journalist's fate. It also adds to the drumbeat of American politicians and business leaders demanding answers and, in the meantime, withdrawing support from Saudi-sponsored functions. Treasury Secretary Steven Mnuchin took to Twitter Thursday to announce his withdrawal from a Saudi-hosted, major investment forum called the Future Investment Initiative, sometimes referred to as "Davos in the Desert". He said he made the decision after speaking with President Donald Trump and Secretary of State Mike Pompeo. 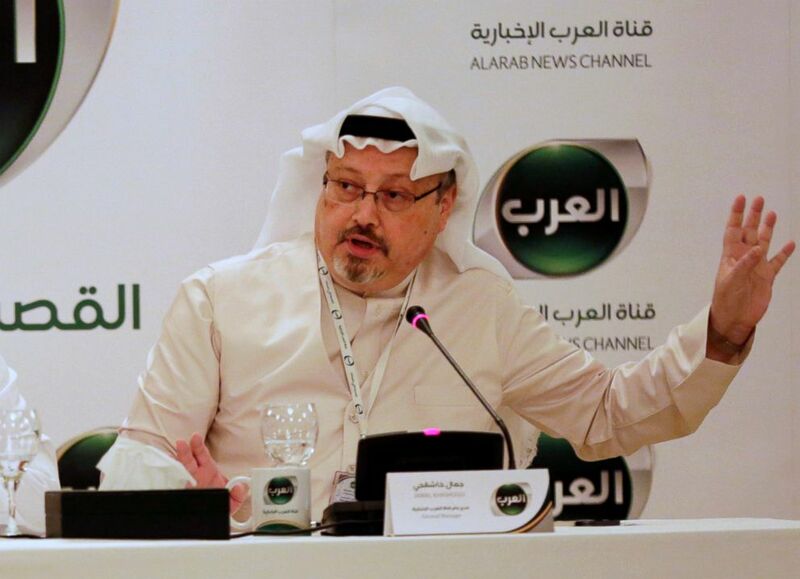 Several business leaders and media companies have also pulled out of the event over concerns about the Khashoggi episode, including Uber CEO Dara Khosrowshahi, Viacom CEO Bob Bakish, Virgin and its CEO Richard Branson, venture capitalist and AOL co-founder Steve Case, LA Times owner Patrick Soon-Shiong, Bloomberg Media, and CNN, among others. Earlier in the day, Pompeo said he told President Trump that the Saudis should have “a few more days” to complete their investigation into Khashoggi’s disappearance. Trump echoed Pompeo's comments shortly after, tweeting that the secretary of state met with him Thursday morning and discussed in "great detail" the investigation and meeting with the crown prince. Secretary of State Mike Pompeo shakes hand with a Saudi official before leaving Riyadh, Saudi Arabia, Oct. 17, 2018. Pompeo's comments also come amid ongoing speculation that Turkey may have audio tapes that reveal what happened to Khashoggi, a Saudi journalist and royal insider who has been missing for over two weeks after entering the Saudi consulate in Istanbul. 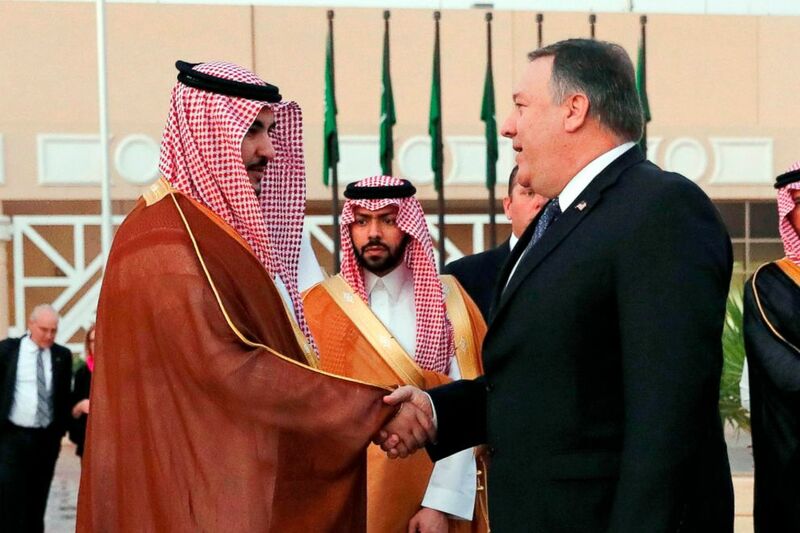 Pompeo met with Turkish President Erdogan and Foreign Minister Mevlüt Çavusoglu Wednesday but refused to express any doubt or skepticism about the legitimacy of a Saudi investigation into Khashoggi’s disappearance. Following that meeting, Trump stressed that his earlier comments about Saudi Arabia's denials of any involvement in Khashoggi's disappearance were not an attempt to give the oil-rich ally cover. “No not at all, I just want to find out what's happening,” Trump told reporters. Khashoggi, who had been living in the U.S., visited the consulate to file paperwork for his wedding and has not been seen since. Turkish officials allege Khashoggi, who has written critically about the Saudi government, was killed, which the Saudis have fiercely denied. Turkish officials say that a hit squad of 15 Saudis flew to Istanbul for just hours surrounding Khashoggi’s disappearance, and they reportedly claim to have audio recordings of Khashoggi being interrogated and murdered. “We don't know if it exists yet. We'll have a full report when Mike [Pompeo] comes back, that's going to be one of the first questions I ask him,” he said in the Oval Office. In his first sit-down interview with U.S. media, a close friend of Khashoggi's described to ABC News what he'd been told in briefings by Turkish security officials. "I talked with some Turkish government and security officials and they said Jamal was killed. I didn't know what to do. I really couldn't answer. Then I called a few colleagues, again security officials, trying to have them verify it, saying 'Is this really true?'" Turan Kislakci said Wednesday. "They said, 'Yes, Turan, and let's tell you even beyond that, he was killed in a very barbaric way.' I was shocked. They not only kill him in the consulate, but also in a barbaric way." Khashoggi warned of increasing efforts to silence the media in the Middle East in a column he wrote just before he vanished earlier this month. The "final column" was published online Wednesday. Karen Attiah, global opinions editor for The Washington Post, wrote that Khashoggi’s translator sent the article a day after the journalist disappeared while visiting the Saudi consulate in Istanbul on Oct. 2. ABC News' Sarah Kolinovsky, Karma Allen and Enjoli Francis contributed to this report.